Green Office® ENJOY is a special building in more ways than one. Built over a railway underpass, it is made largely of wood and produces more energy than it uses. On completion, its 17,420sqm of office space will accommodate 1,250 people, providing both an architectural experience and a user-friendly working environment with the latest technical features. 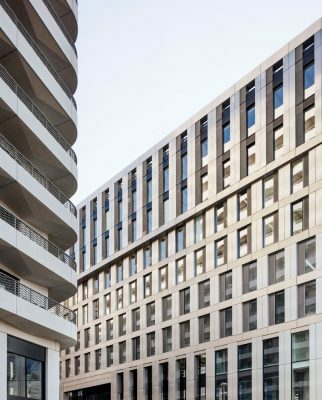 Green Office® ENJOY also occupies a special place within its local neighbourhood, where it marks the north-western entrance to a newly developed quarter and features its own exterior space, 15% of which is greened. Built to positive-energy standards, it delivers optimum quality in technical, architectural and human terms. 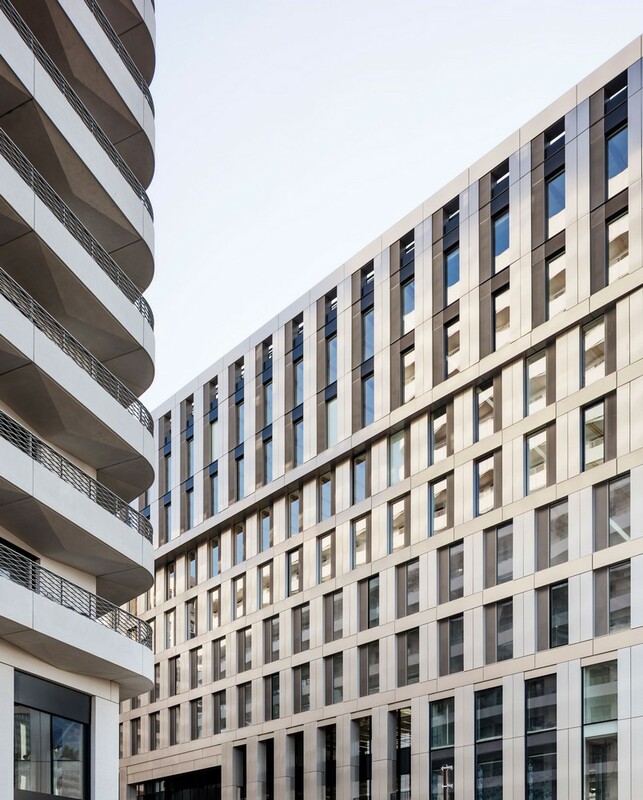 The building and its setting – the new Clichy-Batignolles quarter in Paris’s 17th arrondissement – are entirely interdependent. This interaction is dictated – for one very simple reason – by the structure of the block. If the concrete slab spanning the railway underpass was to take the weight of a building, it had to of lightweight design. With today’s heightened awareness of the finite nature of resources, wood was a natural candidate for the construction material. With Baumschlager Eberle Architects’ long experience in wooden buildings and SCAPE’s expertise in BIM planning, the decision was an easy one. And it was undoubtedly the right decision in terms of both current economic realities and the methodology used. 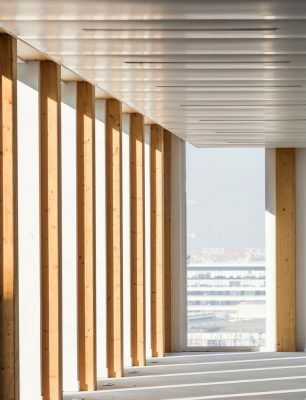 Wood weighs a third less than concrete, which was used only on the ground floor, where it serves to absorb the vibrations caused by passing trains. 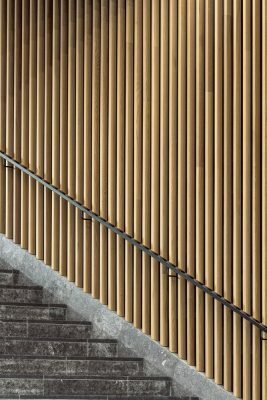 Wood also acts as a natural carbon store and Green Office® ENJOY’s 2,700m³ of Scandinavian and Austrian wood holds 520 tonnes of CO2. 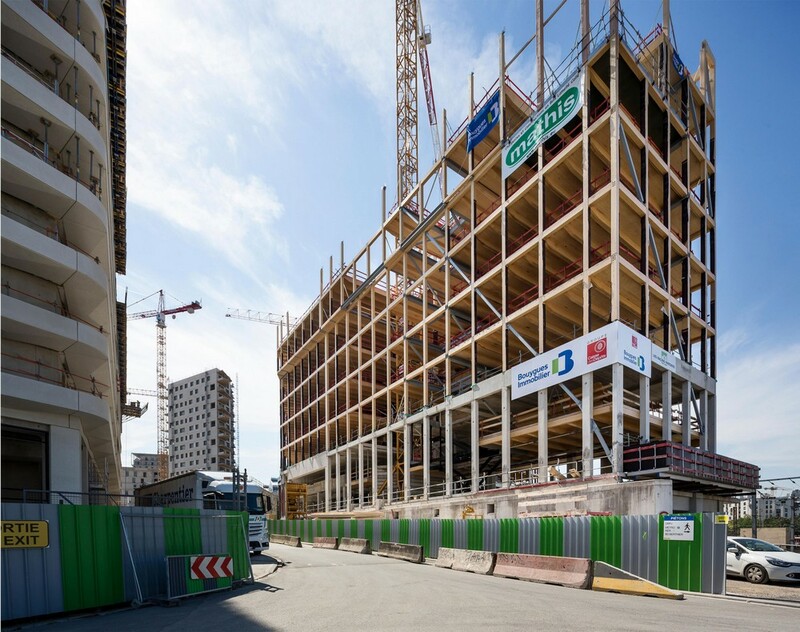 Thanks to the predominantly wooden design, the construction process used 2,900 fewer tonnes of CO2 than a conventional concrete building, the equivalent of planting 1,500 trees and offsetting the emissions of 23 million vehicle kilometres. What is more, this most sustainable of materials was used in the simplest way possible. A classic beam-and-post structure of glued spruce and pine laminate rises above the baseplate, its floors made of cross-laminated pine and fitted with impact sound insulation. 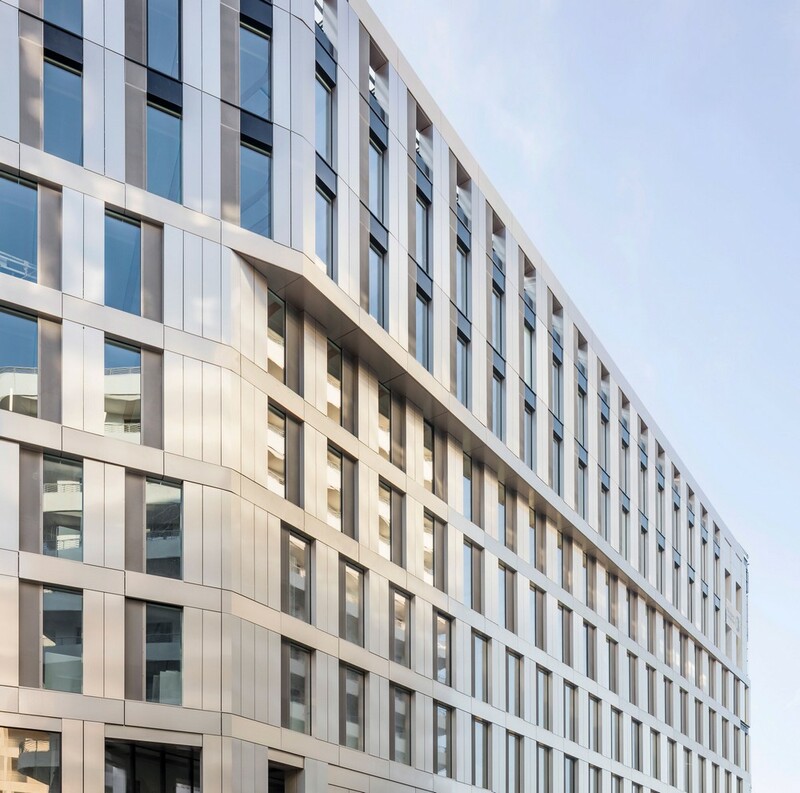 The façades are constructed using a solid timber frame, sterling board (OSB) and mineral wool and finished with aluminium cassettes. Detractors are frequently all too ready to associate wood with the risk of fire and the attendant reservations. Few, however, take the time to look behind the familiar images of burning wooden structures and see that behind the flames wooden buildings often withstand fire for long periods. Even in a worst-case scenario, which we hope never occurs, the qualities of wood are evident. Tests in Austrian research institutes have shown that wooden load-bearing structures can withstand the onslaught of 1000-degree flames for more than 90 minutes. In fact, exposure to fire creates a solid layer of carbon capable of protecting the wooden core for a considerable length of time. There are therefore many reasons for using wood, including economy of resources and safety. However, wood, a genuinely renewable material, has much more to offer. For one, it provides atmosphere. 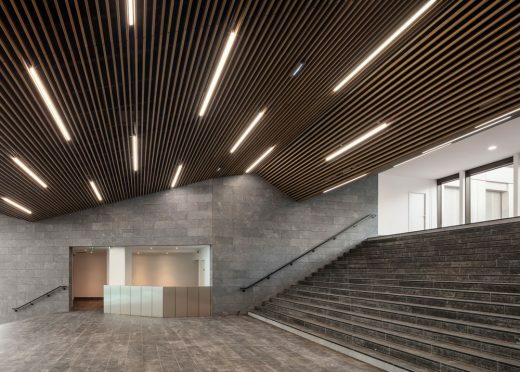 Visible throughout the offices, it brings nature into the building, not that you have to go as far as the versatile working spaces, all with exterior views, to appreciate it. 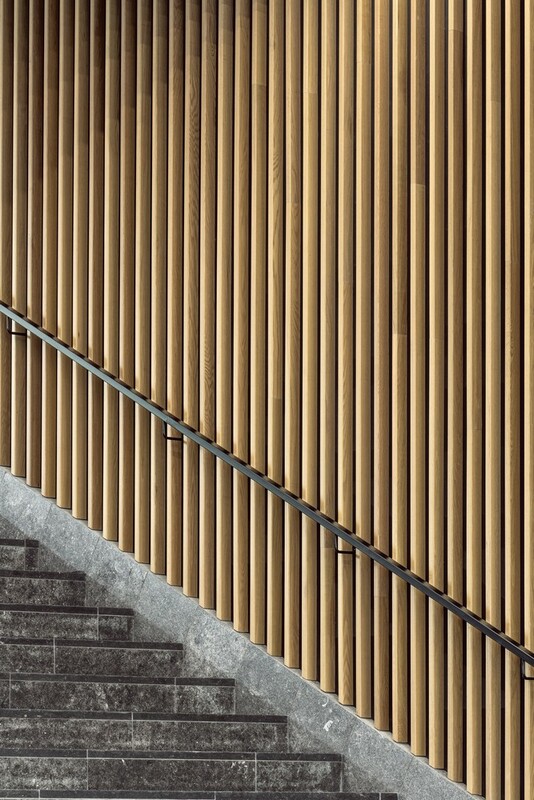 The impressive foyer, for example – another very special feature – is also clad in wood. Both the material and the sight line from the street herald the landscaped courtyard area, its approach route running right through the building. Unlike common or garden perimeter block developments, Green Office® ENJOY is a transparent building. 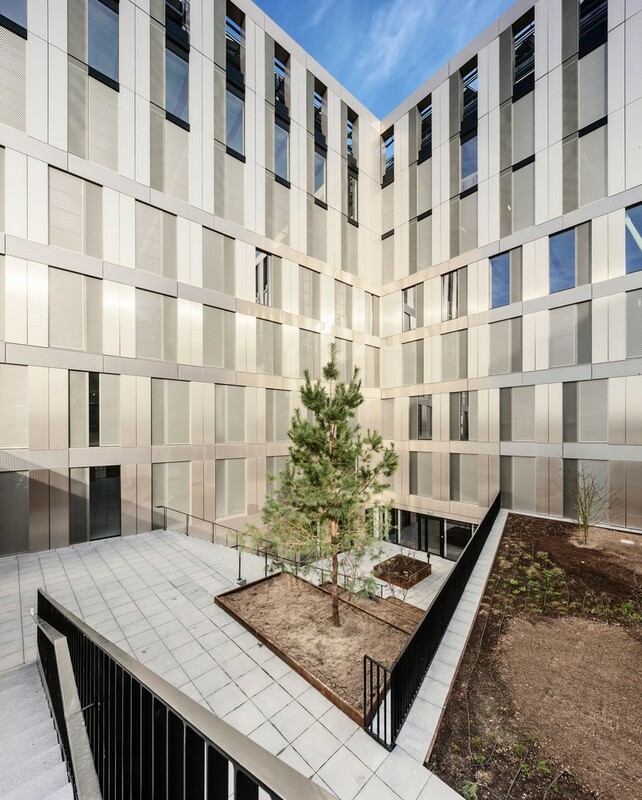 Baumschlager Eberle Architects and SCAPE have consciously revisited the street-facing design of traditional Paris buildings with their strict boundaries between private and public spheres. This is a boon for building users, who have an easy walk from the local metro station through the Martin Luther King Park to the courtyard and its views of the local surroundings. 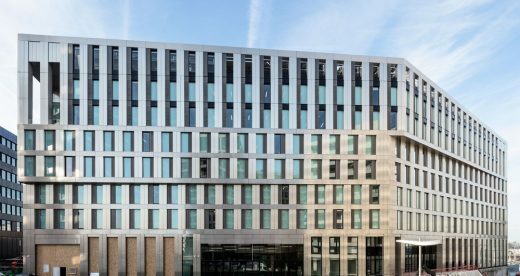 Just as the approach through the park makes for an unusual, not to say innovative experience of the city, the general layout of this positive-energy building makes the most of its location. The three wings emanating from the core fulfil their roles in terms of the exterior space in quite different ways. The two wings which make up the gently angled façade on rue Mstislav Rostropovitch follow the line of the street. The added value produced by this arrangement is immediately visible, the narrow end of one wing marking the gateway to the new quarter, that of the second emphasising its corner location. It all works quite naturally without the need for complex construction techniques or architectural flourishes. But even that is not all. The building’s third wing, together with its two counterparts, in relation to which it forms a right angle, creates two highly interesting exterior spaces. To the north-west the building opens up in a generous gesture to embrace the surrounding urban space and the railway tracks. To the south-west, on the other hand, it encloses a landscaped courtyard. 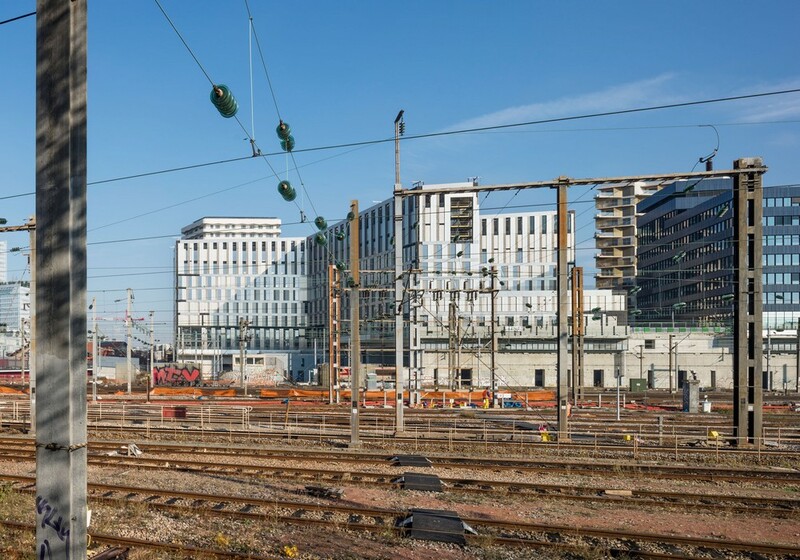 Rising only seven stories, its façades visible to the passengers in passing trains, the block offers both macroscopic and microscopic planning detail. Whichever way you look at it, Green Office® ENJOY provides a real architectural experience. 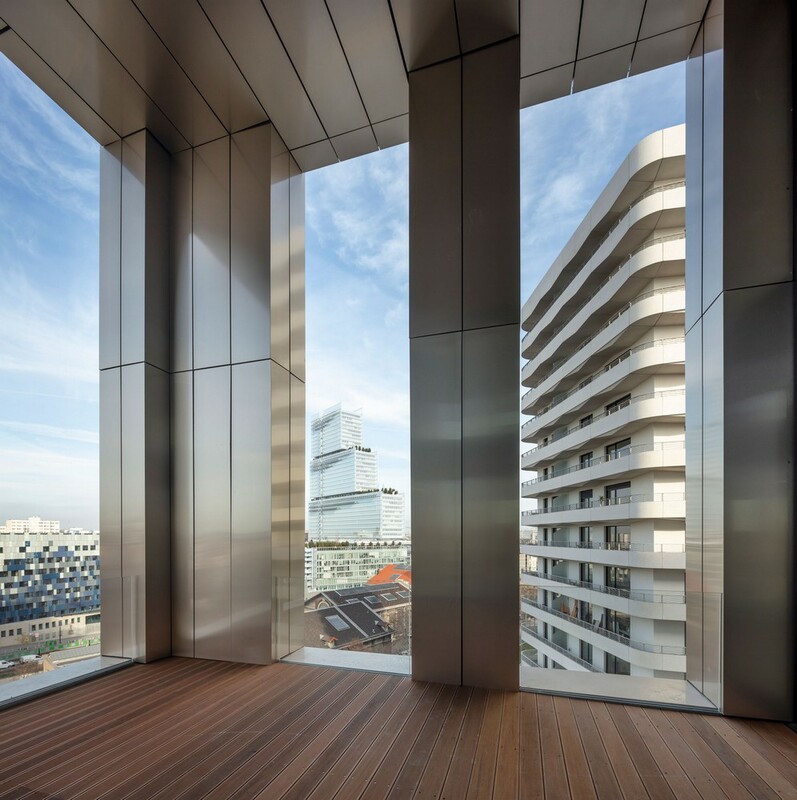 Not only for passers-by, but also for the building’s users, who can enjoy their surroundings from three covered terraces on the fifth floor. In the south, the view stretches away to the Sacré Coeur; to the west lies the Eiffel Tower, while the terrace on the northern side looks out towards the nearby Palais de Justice. The building is every bit as logical in architectural terms as it is in relation to planning. The approach adopted by partners Baumschlager Eberle Architects and SCAPE makes reference to the elementary nature of the building medium without the need for messages or imagery (aerodynamics or biomorphic shapes). At Green Office® ENJOY, the building shell spans the entire building space. This outer surface, its multiple layers revealing inner depths, lends a certain sculptural quality to the cityscape. And when it does have a message to convey, it is a nuanced one. 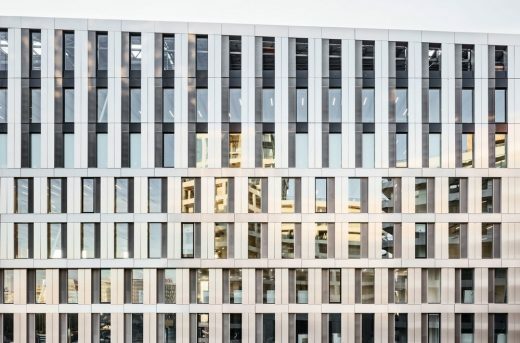 The tall windows and accompanying aluminium panels give the façade a clear verticality, a reference to the fundamental character of the architecture: the fact that it is standing. It may sound simplistic, but the aesthetic expression of this elementary quality imbues the building and so, hopefully, its users with great calm and a feeling of the natural in a world bursting with urban and digital imagery. Even the colour plays its part in the process. Referred to as ‘cappuccino’, it evokes both the old railway tracks of Batignolles station and, in a nod to the here and now, the staple food of many office workers. In addition to this fundamental statement, the architecture brings a number of cultural and historical references into the mix. Unlike Vienna or Berlin, the old, historic Paris of Baron Haussmann is characterised by strong vertical façade elements and classic first floors with tiny balconies. Clichy-Batignolles marks a return to these verticals, the slightly projecting first floor moving to the upper stories in the spirit of the times and the balconies mutating into generous panoramic terraces, now almost at roof height. Sustainability is a central theme in the design process used by both Baumschlager Eberle Architects and SCAPE. 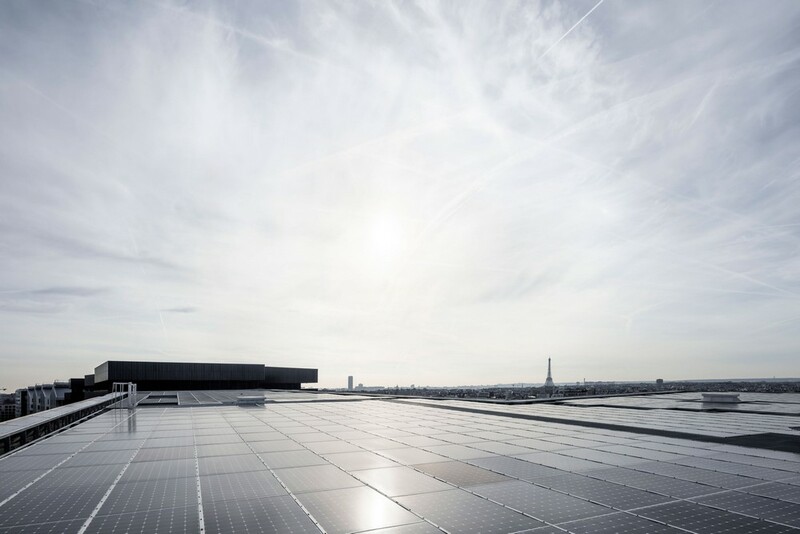 Here the large roof spaces of Green Office® ENJOY play an essential role, their photovoltaic systems transforming the free energy supplied by the sun. 1,950m² of solar panels generate 23.5kWh/(m²a) of solar energy which, offset against the building’s own very low consumption of 19.1 kWh/(m²a), create a surplus of 23% pollution-free energy. 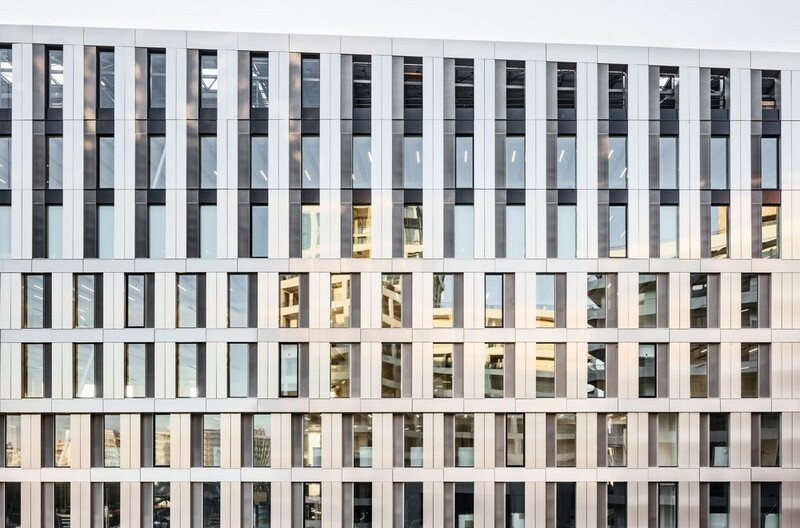 Green Office® ENJOY is the only building in this major Paris development area to meet positive-energy standards to date. 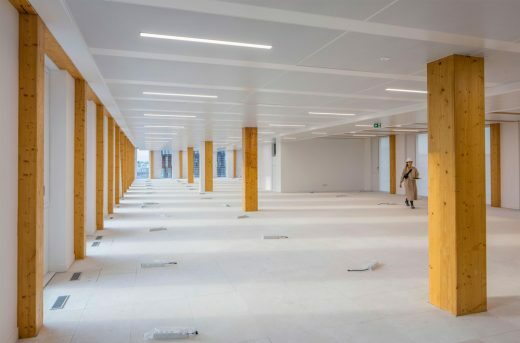 But the building uses resources sparingly even without this active energy production thanks to the heating/cooling ceilings inside the building, its connection to Paris’s district heating network and the programmed longevity of the architecture itself. Despite excellent incident natural light, in an architectural design that is inherently resource-saving, windows make up only 37% of the compact building’s shell, demonstrating that there is no contradiction between economy and ecology. Green Office® ENJOY deserves its positive-energy label not only for its technical prowess, but also for the comfort, spatial experience, beauty and green space it brings into the every day lives of the people who work in it, keeping their personal energy levels in the positive range longer than conventional office developments.